There's been a lot more noise over the last few years concerning Christmas shopping, or to be more precise where we do our Christmas shopping. I've been thinking a lot about this recently and I'm definitely planning on shopping from independent shops or from local makers on etsy. 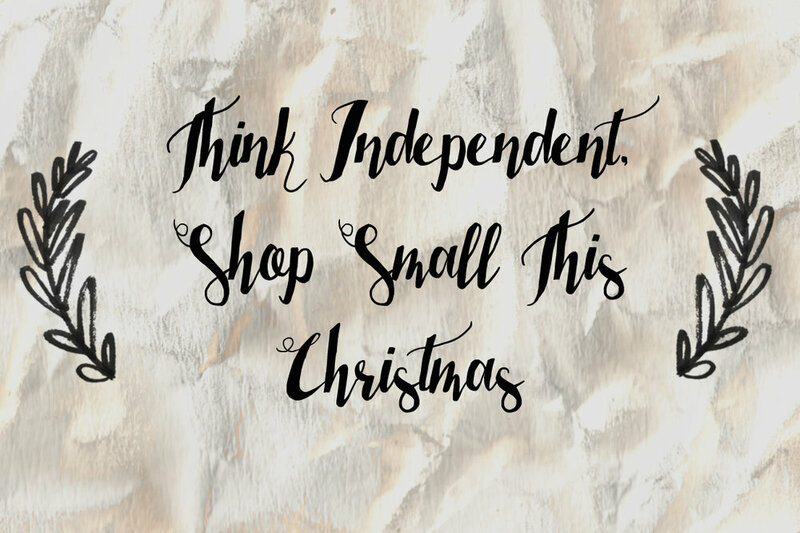 I think it's so important to support local and small businesses and luckily in Kent there are so many really cool independent shops. I think the trickiest thing is going to be finding things that people want and would like to receive as there are only so many scarves you can give a person. My sister has already given me her Christmas list, most of which are items from the usual high street chains, so I'm planning on taking that list as inspiration for similar items from independent shops- this could be quite difficult as my sister is pretty particular! Around this time of year there are always so many craft fairs where you can pick up some really cool unique gifts that are a little different to the usual high street offerings. I've been knitting away to make some smaller gifts and stocking fillers to add to the homemade vibe this Christmas. So with shopping small in mind here are a few that I like the look of! The Proper Tea Company because you can never go wrong with tea! I like the sound of their Christmas tea and their Cinnamon tea. I've been following Eastern Biological on Twitter for a while now and they have some really cool prints and gifts on their site. I'm pretty sure this counts as independent! I love Lyndsey Green's shop on Etsy, her illustrations are so cute! Sketch Inc. on Etsy has some really cool geometric brooches which I'm slightly in love with. I also really like the look of Little Wren Pottery on Etsy too! Nautical Nell has some beautiful nautical inspired prints, she's located in Brighton too! I recently found out about The Recycled Candle Company, through an interview on Bless The Weather. I like the sound of the fig and vanilla scented candle! Pebble and Dash are based in Herne Bay and are definitely worth checking out. Somnus and Seb make the cutest felted baubles and robins. If you're looking for some handmade glass items then Glass Styles might just fit the bill!